Subprime Auto-Loan Backed Securities from 2015 on track to be Worst Ever. Institutional investors that manage other people’s money grabbed subprime auto-loan backed securities because of their slightly higher yields. These bonds are backed by subprime auto loans that have been sliced and diced and repackaged and stamped with high credit ratings. But those issued in 2015 may end up the worst performing ever in the history of auto-loan securitizations, Fitch warned. And then there are those issued in 2016. They haven’t had time to curdle. The 2015 vintage that Fitch rates is now experiencing cumulative net losses projected to reach 15%, exceeding the peak loss rates during the Financial Crisis. The 2015 vintage has been prone to high loss severity from a weaker wholesale market and little-to-no equity in loan contracts at default due to extended-term lending, a trend which was not as apparent in the recessionary vintages. Negative equity hits all-time record. The average negative equity in vehicles that were traded in for new vehicles during Q1 2017 has reached $5,195 per trade, the highest ever, according to Edmunds data, cited by AutoWeek. The percentage of trade-ins with negative equity has surged to 32.8%, also the highest ever! Average negative equity exceeded $4,000 in Q3 2013 and hasn’t looked back. This negative equity in the trade is then rolled into the new loan, thus increasing the negative equity in that vehicle from the first second, which sends net losses soaring in the event of default. Why is negative equity such a growing phenomenon? Because of the toxic trifecta in the auto industry, now happening. Lengthening loan terms. The average new-vehicle loan term in Q1 2017 reached a record of 69 months, up from 64 months in 2011, according to Edmunds data. Terms between 73 and 84 months (7 years!) accounted for a record of 32.1% of all new-vehicle loans in Q4 2016, up from 29% a year earlier. Among used-vehicle loans, they accounted for 18%, up from 16% a year earlier. The value of a new vehicle declines sharply over the first few years. But the loan doesn’t amortize at this pace and doesn’t catch up with the dropping value of the vehicle until the later stages of the loan. As many consumers like to get a new vehicle every few years, these longer terms add to the negative equity at trade-in time. Rising transaction prices. Vehicle prices have surged in general. And consumers buy more expensive models because low interest rates and longer loan terms make this possible by keeping the payments down. Falling used-vehicle values. The seasonally adjusted Used Vehicle Price Index by J.D. Power Valuation Services (formerly NADA Used Car Guide) in May has declined for the 10th month in a row, now down over 13% from its peak in mid-2014 and at the lowest level since September 2010 [Used Vehicle Trade-in Values Sink, Hit New Vehicle Sales]. These factors, along with aggressive lending, propelled new vehicle sales to new records in 2015 and (barely) in 2016. But now the blowback has started. The net effect going forward translates into greater losses for lenders and investors in case of default after the car is repossessed and sold, and ultimately – now happening – lower sales for automakers. Fitch isn’t alone in warning about soaring defaults and net losses of subprime auto-loan backed securities. Moody’s also warned. 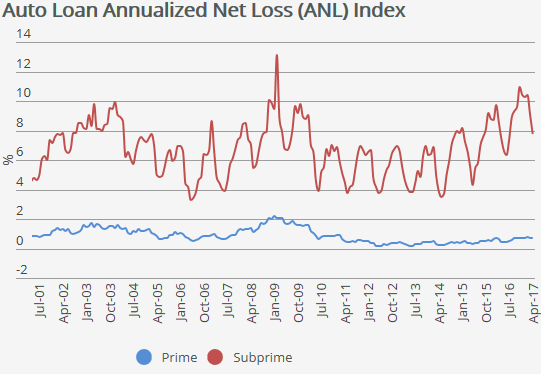 And S&P Global Ratings pointed out recently that net losses even on prime auto-loan backed securities have risen at the fastest pace since 2008. For now, downgrades of subprime auto-loan backed securities are still modest. Ratings agencies cite structural enhancements, such as the slices that take the first loss and that have been retained by the lender. Investors that bought the highly rated slices might be spared initial losses. If losses continue to surge, even highly rated slices are starting to take losses. But auto lenders that sold the subprime securities are starting to get hit. Fitch warns particularly about those that have sprung up since the Financial Crisis and have specialized in subprime auto loans, using looser underwriting standards. Lending by these weakly capitalized lenders has grown at magnificent rates in recent years. Some of those lenders have specialized in “deep-subprime” auto loans. And those lenders might be at risk. Even with these slew of bad news.. I only see people spending a lot of money on housing and other discretionary items.. I am not sure if the so called bad conditions on the ground would ever match the real estate prices and stock market..
Add to that restaurants both chain , middle and high end activity on the wane .. and a whole lotta people well heeled and otherwise holding on to their $$$ .. The only thing I would say is that a lot of people thought the same thing 10 years ago. That’s true but 10 years ago nobody would have imagined central banks printing trillions from nothing and going ZIRP with interest rates. Their only trick for the next collapse will be printing trillions from nothing and handing it out to the average schmuck in hopes that they will use it to continue the madness. Not likely to end in a pretty scenario this time. What about the recent fall in payroll and other taxes? Rents are down in formerly high priced cities while lagging towns report record rents. Something’s up and all I know is that there will be CHANGE as things cannot remain as they are right now. Everything is in a bubble. Stocks, housing, autos, tech, crypto currency, private debt, government debt, student debt, pensions, etc. Even one of these bubbles would have been unimaginable 20 years ago. Today they are everywhere. And common. And barely raise an eyebrow. In misery, bankruptcy and ruin. And then in war. Fast rising debt meet rising interest rates the fuse is lit and the clock is ticking .this will not end well. With interest rates so low it’s taking longer to get there but it will get there.I think Deep down the fed knows it. Respectfully, I disagree. Interest rates rise naturally when economic growth picks up based on strong fundamentals. I don’t believe economic growth will ever pick up again. And I mean ever. So interest rates will always stay low. With low growth, wages must stagnate. The very wealthy do not like their own wealth stagnating. So their income must come from the weaker classes and flows into assets (stocks and property). If my theory is true, this is just the new normal. It is the economy adjusted for permanently lower growth rates. I don’t know. But the FED might not have much room to lower rates (from this level) when the SHTF for real. We have had 7 good years and I’m dreading the coming 7 bad years. War to distract from the economic messes? Low rates resulted in the weak economic growth we’ve experienced since 2001. Rising borrowing costs drive economic growth higher. Your theory? Weren’t Japanese already doing it for like 20 years now? Yes. And it is the exact same problem. Think the growth of the auto industry. Created millions of jobs. Americans could buy expensive cars and they would pay for themselves because you could drive to a better job. And now you didn’t have to live in the city. So you got 10’s of millions of suburban homes built which created 10’s of millions of jobs. There are no drivers of wealth like that today. And nothing on the horizon. Japan has the same problem, as does Europe. Only emerging countries have those opportunities. But they too often also have incompetent governance. Couldn’t agree more – the number of bubbles are so unbelievable that people have just detached from reality (and greed is running amok). Welcome to a full-force concert on the Titanic. So has Santander supplanted Ally ( formerly GMAC Financial ) as the leader of the automotive subprime loan pack ? Or is there some alliance there [ pun not intended ] I haven’t heard about ? Ally is a big subprime lender, but it doesn’t nearly have the problems that Santander has. Also, Ally no longer belongs to GM. GM’s captive finance company is GM Financial. So if your car loan gets approved at Ally, it should not make any difference whether its a Cadillac or a BMW, given equivalent amounts. And at least one of them, >>> Santander Consumer USA, <<< the top subprime auto lender in the US, verified income on only 8% of the loans, according to Moody’s. So here we go again. Sooooo – seems to me that the Spanish bank – Spanish Santander Group – has been putting some of their money into the US market…? Better and SAFER returns here than there are in the EU? Or so they thought?? Yeah, Santander Consumer USA was partially spun off via an IPO in the US in 2014. These US-traded shares have crashed 56% since July 2015 (when the sun started shining on some of the issues at its US operations). They used to be Sovereign. Try reading my blog, they fired me for blowing the whistle on their little enterprise while I was still in training in their vault. I am an aspiring (wannabe) Enrolled Agent in the accounting sector professionally. I will do anything to keep these corrupt banks that destroyed Cypress and Italy from destroying our nation like they did theirs. I believe they hired people from my state deliberately in their PA offices in order to find ways to launder money they took out of Italy during their banking and financial crisis. I have believed it as I worked there in 2014 and yes they are engaged in some type of market fixing and rackateering. They have plans to expand their operations to CA. I worked for them while I was temporarily in PA and am from CA. I want to keep this bad bank out of my state and out of the real estate mortgage market. Our banks might be bad but they aren’t literally ISIS. These ones really do fund all the wrong things. So Santandar owns the ugly tranches? That can’t be good for their creditors. “The value of a new vehicle declines sharply over the first few years. But the loan doesn’t amortize at this pace and doesn’t catch up with the dropping value of the vehicle until the later stages of the loan. As many consumers like to get a new vehicle every few years, these longer terms add to the negative equity at trade-in time. Excuse my naivete, but are you saying that most people who trade in do so for a NEW vehicle as opposed to a used one? That makes zero sense to me. In the past 20 years, I have bought 2 cars, both used. I sold my Acura to a poor kid out of high school for a pittance at 190k miles. The other is still in use. Why would someone take a loan to buy a NEW car? Is there some secret that eludes me? Like IdahoPotato, I’m mystified as to why anyone with a functional car would want to trade it on a new one. It’s kind of like trading in your old wife on a new one–it can be very exciting for a while, but eventually that wears off, and you’re left with a lot of expenses (and I’ve noticed that men generally trade down). Better off keeping the old one. In the US, there are about 17 million new vehicles sold every year (maybe wishful thinking for 2017) and about 41 million used vehicles. So yes, more people buy used, but they don’t keep them as long and trade more often, and the dollar amounts are a lot smaller. Yes, the secrete is that my car is more expensive and shinier than yours. Just to give yo an example; there were 2 old Asian women who came to the Starbucks that I used to frequent. They used to sit near me so I could hear stuff that they talked about, and both were on government pension and discussed chapter 8, etc. ; and both of these women had brand new Mercedes. Now, go figure, I make relatively good money, and I don’t even dream of buying a BMW, or Mercedes, and yet here are 2 old women on government pension, and they purchase Mercedes. People are that stupid, and of course the government free money, and low interest that basically shouts “If you actually work, and you are responsible, then you are an idiot” helps a lot. People who are saving money are stupid..
Just like the 10 million borrowers who were foreclosed on from 2007-2011 we’re “bailed out”? Some people have zero dollars to cover repairs so they insist on owning cars under warranty. They’ve been burned in the past with $3k transmission or engine repairs then make a lifelong promise to never own a car out of warranty. Some people see a car as an extension of their wardrobe. But there’s many reasons people get new cars. Yet the new car market is about the third the size of the used car market, if that makes you feel better. As I continue to read story after story about the auto industry, auto finance, delinquencies, etc. I am wondering if the lenders actually try to collect these delinquent loans any more or if they just let them get to 60 days past due, electronically disable the vehicle and send some collection company aka ‘repo man’ out to get the car from the borrower. Many dealers back then were barely surviving (bad economy, high unemployment, sky high interest rates) and a month where they took more than a couple of repo losses might have put them out of business. So, as collectors, we were instructed to ‘work out’ of these problem loans as best we could to keep the customer in the car and avoid the repo for both the customer/borrower and the dealer. It required a lot of hand holding but as a supervisor used to remind us, it was ‘job security’ for us. I think used car prices are declining faster than anyone anticipated. When you load a new car with incentives, why buy used? I own a 2015 fully loaded Nissan Rogue SV – it was just shy of 30k two years ago. I took it to CarMax just to see what I could get for it. They offered me 12k. CarMax has a good feel for the market. They’re buying a lot of used vehicles at auctions and otherwise. I’ve had two good experiences selling vehicles to them. I wonder if they’re starting to get panicky about used car price declines, from what they’re seeing on the ground, not just in the monthly indices. Occasionally I drive cars for a local Ford dealership. The pay is very poor, but it gets me out of the house every couple of weeks and there is no pressure or cubicle-work involved. Anyway, I sometimes go with a group of other drivers to an local auction site to pick up cars the dealer has bought. It has a lot of repos. The last car I picked up for the dealer had a big, red Santander Consumer sticker on the front windshield. The guy at the exit gate peeled it off “because they’re not supposed to go out with the company’s sticker showing.” Needless to say it wasn’t the only red-stickered car in the lot. I wasn’t really paying attention, but I also saw other stickers like Chase.